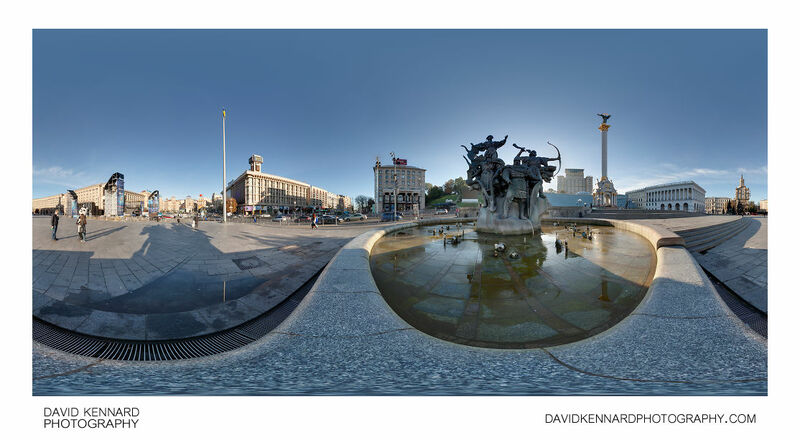 Panorama next to the Founders monument fountain in Independence Square, Kyiv. The monument depicts the legendary founders of Kyiv - brothers Kyi (Кий), Schek (Щек), Horeb (Хорив), and their sister Lybid (Либідь). It was built as part of an overhaul of the square in 2001. To the right and behind is a tall column, also added as part of the rennovation, celebrating the 10th year of Ukraine's Independence. The column is topped with a sculpture of a Berehynia, a female spirit in Slavic mythology.